After graduating from Karachi University with a Masters in Microbiology, Samreen Ali Khan found herself working as a teacher and chemistry co-ordinator at the Oxford School in Dubai. Although she enjoyed her job there, she knew it was not the career that she wanted. 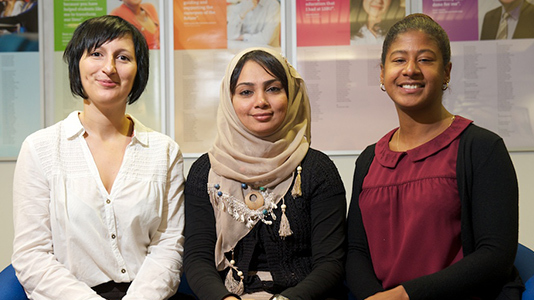 Samreen began looking for degrees that would lead to interesting careers that were well-rewarded financially, and her research led her to LSBU. "I found LSBU to be one of the best universities in the UK when it comes to salary levels," she says. "The high quality of the education available there is well recognised in the global employment market. I was also impressed by the employability services at LSBU, and the commitment to helping graduates find suitable jobs after finishing their degree." Samreen applied to our MSc Food Safety & Control, attracted by the strong professional prospects it offered upon completion. "Britain spends a lot of money to ensure food safety and quality," she says, "so the course gives me the chance to be employed as a food microbiologist or a food scientist. They are professions that pay well, and learning more about food is something I thoroughly enjoy, so the course was ideal for me." After securing her place on the course, Samreen's next challenge was to secure funding for her studies. She had saved some money up from her time teaching in Dubai, but it would not be enough to cover all of her expenses. As part of her investigation into funding, she discovered the Frank Brake Scholarship, available thanks to LSBU alumnus and entrepreneur Frank Brake. There is one scholarship available to students enrolling on our MSc Food Safety & Control course, and is worth up £4,000 towards fees. "The form itself was easy to fill out and submit online, but I was nervous about my interview," recalls Samreen. "When I found out that I had been successful, I was on top of the world. I felt proud and honoured to have been selected for the scholarship, which has taken a huge financial burden off my shoulders." Without the scholarship, Samreen may have struggled to fund her Masters education. "If I had not been given the scholarship, I may have had to carry on working as a teacher in Dubai, missing out on the chance to further my career in the food industry, which was my dream," she says. Samreen is determined to make the most of the opportunity that the Frank Brake Scholarship has presented her with. "I have the chance to gain a quality education from a renowned UK university, and to gain a Masters degree that is recognised all over the world," she says. "After graduating, I would like to work as a Food Technologist or a New Product Development Manager, where I can use my expertise in microbiology and food safety to improve food hygiene standards."